Pompey have moved to secure the futures of Dan Butler and Adam Webster. The home-grown pair have been offered new deals to keep them at Fratton Park beyond this season. Both are out of contract in the summer and Awford has identified retaining them as a priority during his squad revamp. Butler has re-emerged into the first team this season, dislodging Nicky Shorey at left-back before his AFC Wimbledon dismissal. Webster was recently sidelined with a knee injury but has returned to start the past two matches at right-back. And Awford is hopeful both will agree to remain with the Blues. 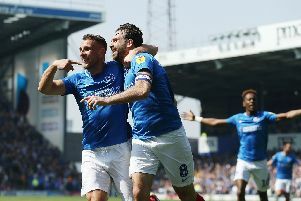 ‘Dan and Adam have been offered a new contract,’ said the Pompey boss. ‘We are currently in early negotiations with both to keep them at the club. ‘I believe they should be part of this club’s future and both are out of contract in the summer. ‘Dan had played five games in a row before his sending off and done well of late. Like Adam, I think he can go on to become a very good player. ‘They are both under 24 so are not frees. If somebody wanted them they would have to give you compensation. ‘But it is not about that for me, I want good players at the football club. They are both good players so we have started negotiations, and come the transfer window we will nail that down a bit. Butler has made 17 appearances so far this season, taking his Pompey career tally to 37. The 20-year-old made his debut in August 2012 in the 3-0 Capital One Cup defeat at Plymouth. He finished that campaign being a regular under caretaker boss Guy Whittingham, earning a two-year deal. Last season he was loaned out to Aldershot, where he suffered cruciate knee ligament damage. Butler returned to the Recreation Ground towards the end of the campaign for another loan spell and has been a regular for Pompey this term. Webster has played 35 first-team games since his January 2012 debut against West Ham. The defender also spent time with Aldershot last season, before Awford brought him back after taking charge. The England youth international has played seven times this season. Awford added: ‘Dan is confident and Nicky Shorey is great with him, a real role model. ‘He has helped him and talks to him, which is fantastic from my point of view. ‘I am pleased with Dan. He is settling into playing and is obviously happy because he has been in the team. ‘Adam is back available again after seven weeks out with his knee injury.